It is party conference season. There are only seven months to go to the general election and while the National Health Service, the economy and immigration will be important to most parties “Palestine” will be more important to the Liberal Democrats as they try to win votes at the expense of Israel and, more specifically, British Jews. They will soon be planning their Mezuzah leaflets. There is no political party that fights an election more viciously than the Lib Dems., and Mezuzah leaflets are widely used by them to ensure that no Jewish house gets one of their “pro-Palestinian” leaflets which is full of anti-Israel propaganda. This is the party that produced Chris Davies MEP who told a Jewish voter that he hoped she enjoyed “wallowing in her own filth”. 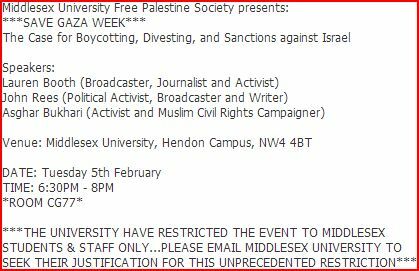 This is the party that produced Baroness Jenny Tonge who, inter alia, adores Hamas leader Ismail Haniya. This is the party that wants to keep Israel as vulnerable as possible. During Operation Protective Edge they called for a ban on weapons being sold to Israel just as Israeli citizens were coming under sustained rocket attack from Hamas. And this is the party which still has David “the Jews haven’t learned from the Holocaust” Ward as an MP. Lib Dem. 1: We need a Jew on the panel. Lib Dem. 2: Yes, good point. A good Jew though. One that wants a one-state solution and who supports a boycott of Israeli products. Lib Dem. 1: Ok, then. I’ll try and get hold of one of those nice Jews from Jews for Justice for Palestinians or from Independent Jewish Voices or, even better, from the International Jewish Anti-Zionist Network. You would really hope, wouldn’t you, that in 2014 the Liberal Democrats wouldn’t pin the religion of someone as being their most defining characteristic. But when there are votes to win the Lib Dems. punch hard below the belt. Having “a Jew” on the panel is important for two reasons. It is more likely to convince the audience of the argument against Israel on the basis that “if a Jew is saying this it must be true”. 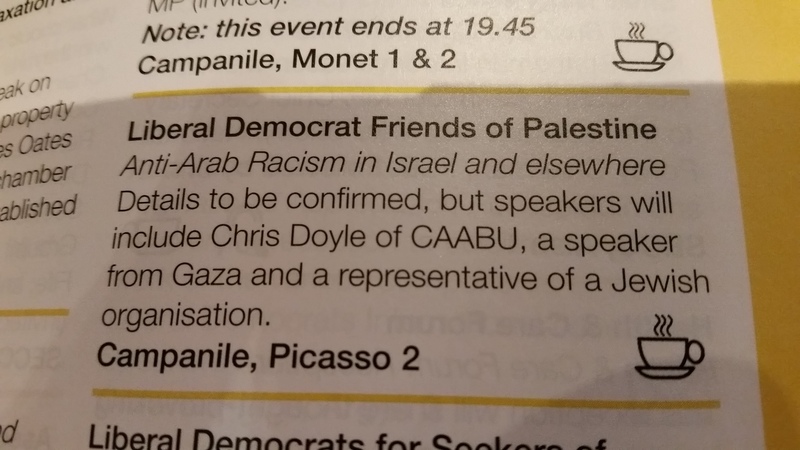 Second, it allows the Liberal Democrats to convince themselves that anti-Semitism isn’t rife throughout their party because they can now now claim “but we’ve got a Jew on our panel”. So if you are a “good Jew” reading this then get your train ticket for Glasgow. The Liberal Democrats urgently need you. 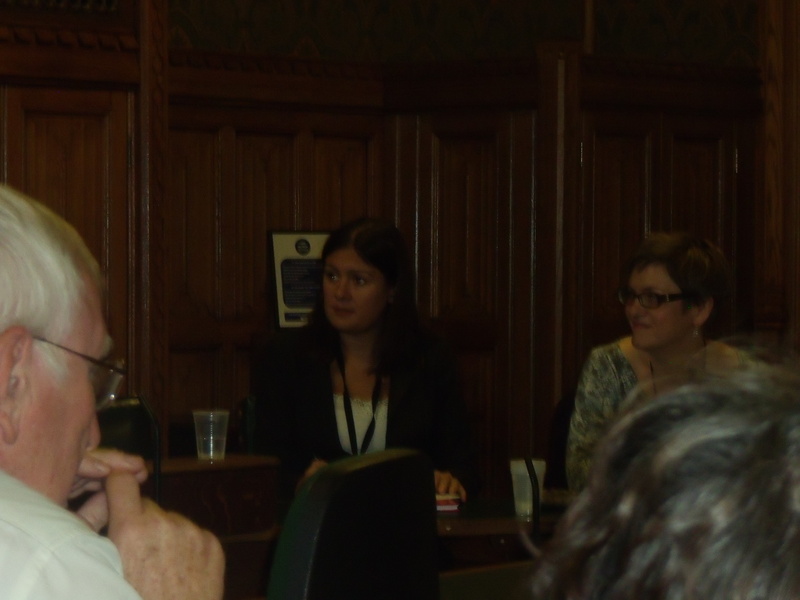 Labour MP Lisa Nandy (Shadow Minister for Children) and Palestine Solidarity Campaign’s Sara Apps in Parliament last night. In the House of Commons last night Wigan’s Labour MP Lisa Nandy (Shadow Minister for Children) described how she found herself disturbed by a recent visit to an Israeli military court after seeing how “Palestinian children were treated” and how they were found “guilty on flimsy evidence”. She said there was “no justice in the (Israeli legal) system”. Judging by Nandy’s articles she is no friend of Israel anyway. 2. The welfare of Palestinian child suspects. 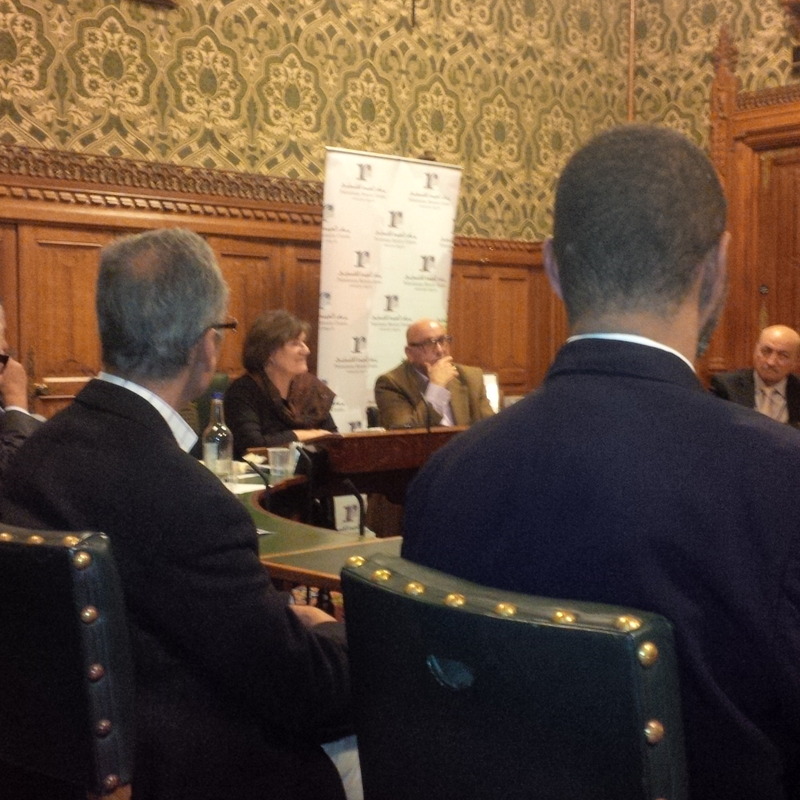 Last night’s event was held to review whether the situation had improved for Palestinian child suspects since last year. You wouldn’t be shocked to hear that the answer given by Jude Lanchin was “not much”. Lanchin, one of the nine lawyers and who, herself, works for Bindmans solicitors, said that apart from two military orders nothing much had changed on the ground for Palestinian child suspects. She highlighted the main procedural differences still affecting Palestinian and Israeli children respectively in the criminal justice process (see page 7 of the report). During the Q&A I asked Ms Lanchin whether the procedural differences in the criminal justice process between Israeli and Palestinian child suspects could possibly be attributed to the difference in the nature of offences committed by Israeli and Palestinian children with Palestinian children being mainly arrested for stone throwing; a security/terrorist type offence that can kill and maim Israelis. 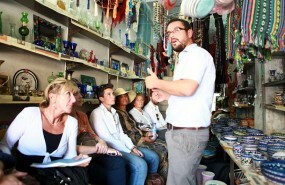 We were grateful to receive a response to a comprehensive list of enquiries from the Israeli Government; however, the evidence was limited to one stone-throwing incident in September 2011 which caused the death of an adult and a child, and sight of a photograph of a man with fairly severe facial injuries. “The evidence was limited” to two deaths? How many more do these lawyers want? This is the same argument put forward when Israel is accused of acting disproportionately in defending itself against Kassam rockets that have killed relatively few Israelis but which are, still, deadly. Stones, like Kassam rockets, kill and maim. 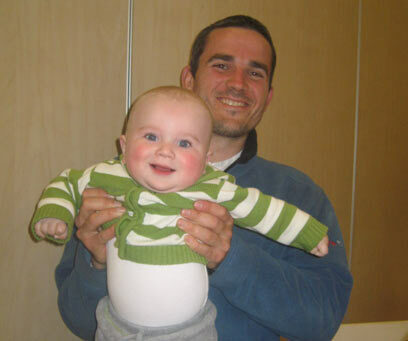 Ask the family of the murdered “adult and child”: Asher Palmer and his infant son, Yonatan. Asher Palmer and his son both murdered by a Palestinian stone-thrower. The report also criticises Israel’s welfare treatment of Palestinian child suspects. 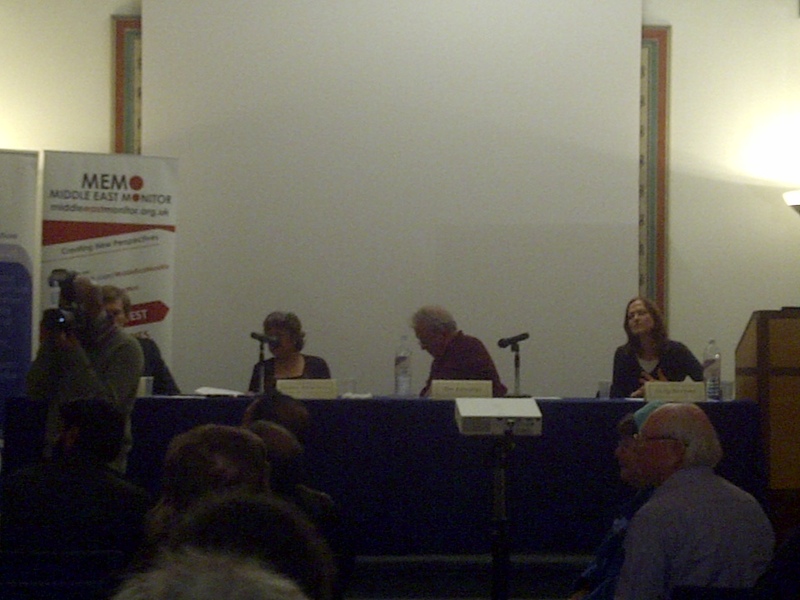 However, the evidence relied on by the nine lawyer committee is both mainly anonymous AND provided by organisations traditionally hostile to Israel like Breaking The Silence, Btselem and Defence for Children International Palestine, to name but a few. A main criticism of Israel in the report is Israel’s arrest of Palestinian child suspects very late at night. Israel’s Ministry of Justice responded that “nighttime arrests are necessary for security” (see paras 51 and 52 of the report). The report recommends that a summons should be used instead, but the Ministry of Justice replied that this is not feasible. Israeli police or soldiers entering a Palestinian neighbourhood during the day to make arrests would have major security risks. As ever, Israel is criticised whatever it does. 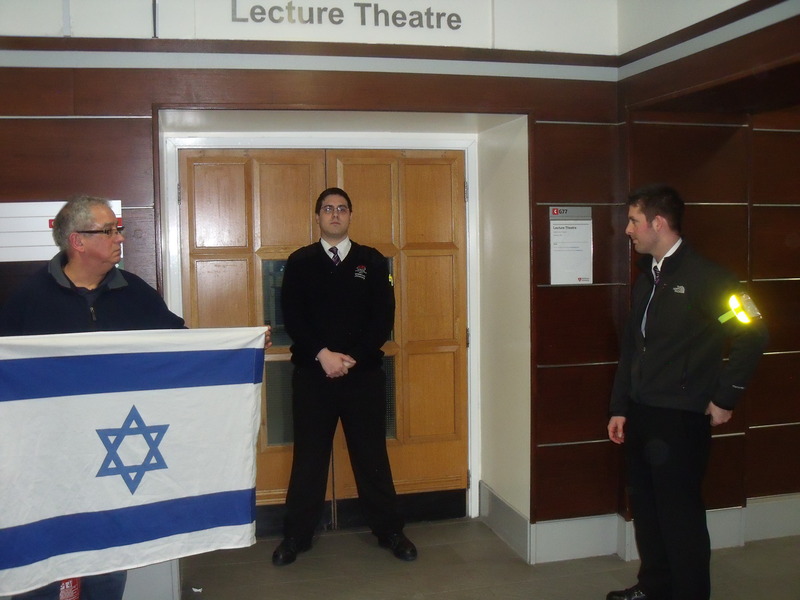 Sir Geoffrey Bindman QC, of Bindmans solicitors (Jude Lanchin’s employer), was also on hand last night to condemn Israel as usual. He spoke of “Israel committing outrageous and illegal acts, yet getting away with it” and said it was all part of Israel’s strategy “to maintain the occupation and prevent a Palestinian state being created”. In summary, the self elected jury of nine lawyers who put the initial report together last year did so while shamefully accepting at face value anonymous evidence from organisations traditionally hostile to Israel while rejecting the legitimate concerns of Israel’s Ministry of Justice. However, it was the presence of another parliamentarian last night, which really spoke volumes: Jenny “Israel won’t be here forever” Tonge. Tonge was sat next to Jude Lanchin while Lanchin repeatedly referred to the help that Tonge was offering the nine lawyer committee, especially in trying to get questions asked in Parliament about Israel. If there was ever evidence of the contempt of court in which this nine lawyer committee should now be held, what more does one need than this?